The Mazda MX-5 Miata has long been one of America's favorite sport cars. 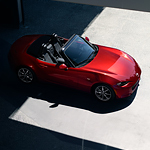 With a new SKYACTIV-G 2.0L engine, the Mazda MX-5 Miata is more powerful than ever before. This new engine configuration is lighter and more efficient, while still cranking out 181 hp. The six-speed manual transmission is beloved by drivers for a reason. In this car, you really feel like you're driving. And the Mazda MX-5 Miata is great at precise maneuvers. It's very light on its feet. The Mazda MX-5 Miata's exterior looks just as sleek and futuristic as ever. This is one of the curviest, shiniest cars on the road. The hard top of the convertible adds to the unity of this car's look. There's nothing to break up the line of the design. We'd love to see you test drive this innovative and great-looking car. Come see us at Fred Mueller Mazda. The best way to understand the Mazda MX-5 Miata's design is to experience it.